Between 1962 and 1970 the (late) Outboard Marine Corporation sold fiberglass boats under the OMC, Evinrude and Johnson names Chris-Craft purchased the molds after OMC ceased production. This page is dedicated to those boats. A Johnson 17 foot Deluxe Runabout. 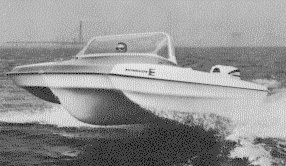 The Evinrude boats featured a "gull-wing" design, which rode on the large center V hull at speed, and were built in 16 foot (1964-1970), 14 foot (1965-1968), and 19 foot (1967-1970) lengths. The boats were solidly built, roomy and stable. The Gull-Wing hulls were designed by Richard Cole, while Brooks Stevens designed the above water styling. Later 16 foot hulls were designed by Lars Granholm and Ralph Lambrecht. 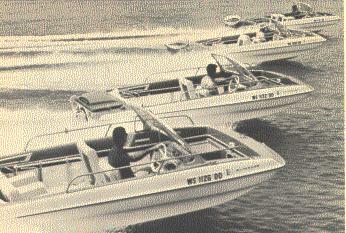 Johnson boats were built in 17 foot (1962-1966), 14 foot (1966-1968), 16 foot (1966-1969), and 19 foot (1966-1969) lengths. 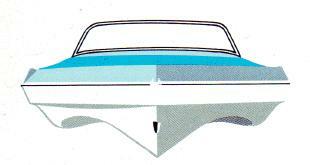 The OMC/Johnson 17 Deluxe above was designed by Harry Hillman was also a tri-hull design. The center hull provides extra lift; at speed it was a three-point suspension hull, riding on the sponsons and an after-plane. 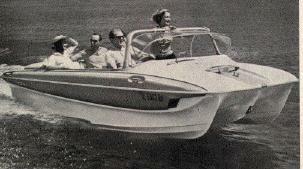 Later boats Johnson boats were Cole and Granholm/Lambrecht designs marketed using the name "Sea-Foil". Photos and scans sent in by owners and spotters have helped make the site what it is! Please keep your contributions comming! Do you have photos of a boat you would like to see added? fill out this form!! * this information can be found on a plate somewhere inside the boat, like this one (Evinrude), this one (Johnson), or this one (OMC Canada). If you own one of these boats (or just love them), you might want to join the OMC-BOATS mailing list! Copies of some original manuals are available from Ken Cook Co!! The Book Evinrude Johnson and the Legend of OMC by Jeffrey L. Rodengen has a few pages of interest. Tail Fins and Two-Tones: The Guide to America's Classic Fiberglass and Aluminum Runabouts has a few photos. Model year, serial number information excerpted from Rodengen's OMC book, model number lists, and boat owners. Lee Shuster also has a list of model number information. Chris-Craft purchased the molds after OMC ceased production, Rodengen's The Legend of Chris-Craft is reported to cover this. Chris-Craft kept the Gull-Wing moniker, and sold the SeaSport and Dolphin from 1971 through (at least) 1974. I run a mailing list called OMC-Boats where owners (and others) can exchange information. The list is SPAM free (only members can post). The list generally has (very) low traffic, but you can sign up a for "digest" to get have the messages collected and mailed out once a day. To post an ad, fill out this form. Remember to include asking price, geographical location and contact information! I cannot tell you what your boat might be worth. I've left old ads in place so you can see what people have asked for theirs. I have no expertise in old outdrives, but check out the engines section below for links. Listings provided for reference/help. Links are not an endorsement, and do not reflect personal experience of the webmaster!! FiberGlassics - Classic Boating (now includes Wood and Alumiclassics! Fisherman's Journal: The Cost of Used vs. a New Boat... (talks about Cole designed Wellcraft Airslot). Standard Motor Products - Indexed and illustrated catalog with OMC electrical parts listed. Stone & Sons Marine, Houston, Tx (Evinrude, Johnson & OMC parts). Evinrude "Skeeter", Johnson "Skee Horse", OMC "Snow Cruiser"
Evinrude and Johnson are registered trademarks of the late Outboard Marine Corporation (now Bombardier Recreational Products). Site created and maintained by Phil Budne. If you have any questions you can send me e-mail. This web site should be considered to be a copyrighted collection, and may only be reproduced with permission. * Site first appeared in January 1998 with "omc-boats" in the URL (over 409,000 visitors). The omc-boats mailing list was created in May of 1998.